Michael Jackson spent the last night of his life doing what he had always done: performing. The singer was in rehearsals at the Staples Center in Los Angeles, running through a full slate of songs from his upcoming 50-concert London event flanked by friends and colleagues. He marveled at the major set pieces that had finally been installed in the rehearsal space. "He was just glowing, and you could see it, that he was finally seeing it all come together," says Dorian Holley, the vocal director for Jackson's upcoming tour. "Up until Wednesday, it had always been [just a concept], but that last day you could see it in him, that he was seeing the show finally come together for the first time. It was a big moment." Holley says he left rehearsals just before midnight on the night of June 24, as Jackson headed off to attend yet more meetings. About 12 hours later, a 911 call would be placed from Jackson's home in Holmby Hills, reporting urgently that "he's not breathing ... He's not responding to CPR, anything." The pop icon had seemed different during these rehearsals  not ailing by any means, but perhaps more contemplative  says Holley, who has coached Jackson on solo tours since 1987. In preparing for previous tours, Holley said auditions for backup singers and other performing roles would usually be held via videotape, and it wouldn't be all that uncommon for the two to speak directly only two or three times over the span of a year. But for "This Is It," the London concerts scheduled to begin in July, Jackson was much more present and available, attending auditions and eagerly talking with everyone in the crew about the larger mission behind the tour. "It almost sounds crazy to say that the show wasn't about him, but ... he'd put it in perspective all the time, saying, 'This is what we're here for, to spread a message of love and taking care of the planet, that we want people to understand it's very, very dear and not to take it for granted,'" Holley tells TIME. Until the last hour of rehearsals, Jackson maintained a ferocious, perfectionist pace, says Holley, who, after decades working with the singer, says he was still astonished by his vocal and physical prowess. Some in the public questioned whether Jackson, at 50, would still be able to command a stage, and recent reports published Sunday in Britain's Daily Mail said that Jackson had been too feeble to dance, sing or, at times, even speak in the weeks leading up to his death. But, Holley  despite his own early concerns about a lack of rehearsal time leading up to the first London shows in July  says the star's presence and energy during his final week was unequivocal. "He'd take the stage with this group of dancers, all in their 20s, but you couldn't take your eyes off him ... Many of his songs have six or seven parts, and he would often come over if we were missing an important note in our mix, and he would sing through all the parts rapid-fire to show us what he wanted. We would just sit there with our jaws open  it was awesome," Holley says. "He could still do everything ... The only difference now was that he would sometimes talk about how it made him sore." "This time around, we had the technology to isolate just his microphone and listen to his singing separate from everything else. I had no idea what a genius he was. The way he's able to use his voice as a percussion instrument, lyricist, jazz singer all at the same time. I'm sure as people mine his works in years to come, they're going to discover how much is there," he says. It was a text message on Thursday afternoon that gave Holley the first hint of bad news  a note saying Jackson had been rushed to the hospital. Neither he nor the crew knew how to react to the uncertainty, so they did what they always did  they went in to rehearse. Except this time, as fans all over the world from Los Angeles to New York City to Tokyo to Buenos Aires played his music, sang his songs and emulated his dance in tribute, Holley says the crew couldn't bring themselves to touch the music. Jackson had been preparing to take the world back, Holley says, and during the singer's final night, he finally knew he was ready. "You would think that, on the one hand, the world has kind of beaten him up, and you could forgive him for having some trepidation and fear. But he didn't have any of that," says Holley. "Words fail to describe what people would have seen with the tour. I couldn't even imagine until last week when it became physically apparent [on the set]. He was ready to show the world, and I so wish there could have been just one concert so the world would have seen." TIME's Commemorative Issue: Remembering Michael Jackson. 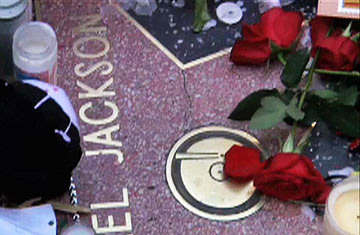 See how to moonwalk like Michael.